A few mornings ago we woke up to over a foot of fluffy, white snow. 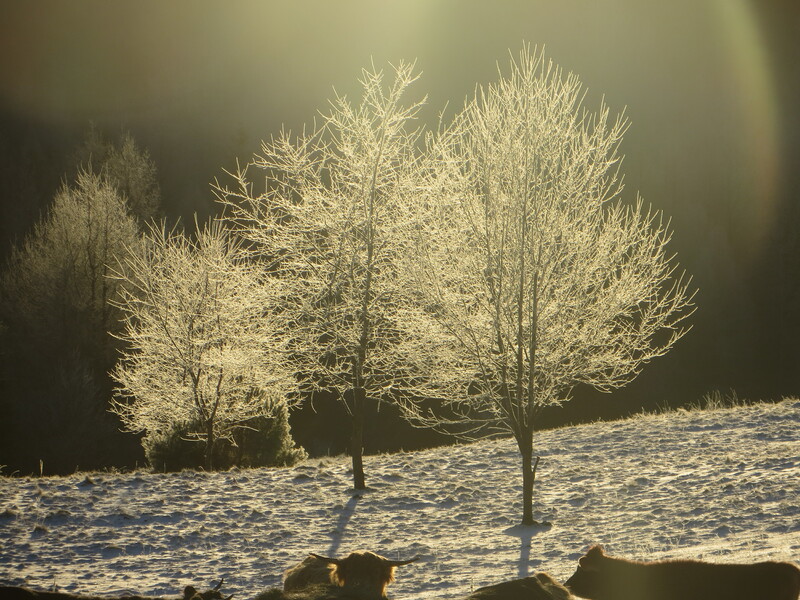 A spectacular winter morning in Vermont. What could possibly be more beautiful? At 7:00am the four of us headed out for shoveling, snow plowing, and chores. This picture-perfect moment, however, quickly disintegrated as the tractor, which we rely on to feed hay bales to both the beef cows and ewes, refused to turn over, the new fuel filter Gabe quickly installed failed to do the trick, and the generator proved to be entirely out of gas. Two hours later of course, after a trip to the Corner Store for gasoline, much navigating in the deep snow with the generator and extended blow drying of the tractor fuel lines, the situation had greatly improved. All animals fed, snow removal underway and hot chocolate for both boys…and yet, I must admit, it is mornings such as this that I find myself wondering, why? Why exactly do we do this thing called “farming”? Hmmm, why farm? Why wake up at the crack of dawn every morning? Why worry about hay? Tractors starting? Animal chores? Why worry about your own snow removal, for that matter? The answer to these questions, at least for our family, is rather simple and perfectly illustrated by a recent trip to Montpelier. Between new snow tires for the truck (which as you all know ALWAYS takes forever), a quick stop for dog food, and unsuccessful stop, after unsuccessful stop in search of the perfect birthday present for a four year old, I found my eyes wide, heart racing, and whole self practically twitching. I vastly prefer, as I have previously mentioned, our self-sustaining oasis to fast-paced, big-city life. And so, the answer to “why farm?” really is simple – it just fits us. 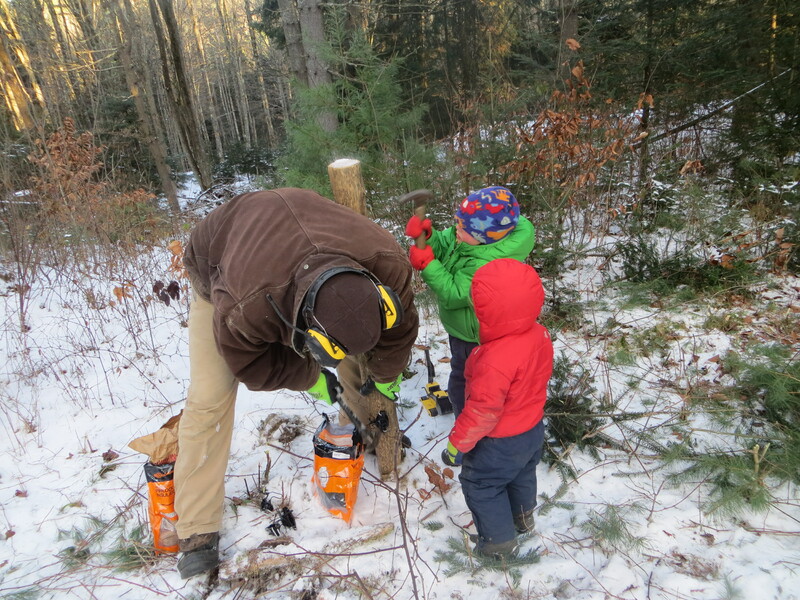 It is not just that we would rather battle tractors and the weather than throngs of holiday shoppers and congested streets, but rather that it allows us to be outdoors, in nature, together. Just the four of us, headed out the door. I hope that this holiday season and New Year, you are able to find whatever it is that fits you. Whether it is farming, an office job, or breaking trail through the freshly fallen snow, find ‘it’ and go for it! Happy holidays, from our family to yours! Hi! Just wanted to leave a note. I have read a few entries now and have really enjoyed them so far. I had to comment here because I could not agree more… “I found my eyes wide, heart racing, and whole self practically twitching. I vastly prefer our self-sustaining oasis to fast-paced, big-city life.” I could not have said any more eloquently! Perfect!